BE SURE TO SCROLL DOWN - THER ARE MANY PHOTOS AND THEY ARE ALL PART OF THE DESCRIPTION. 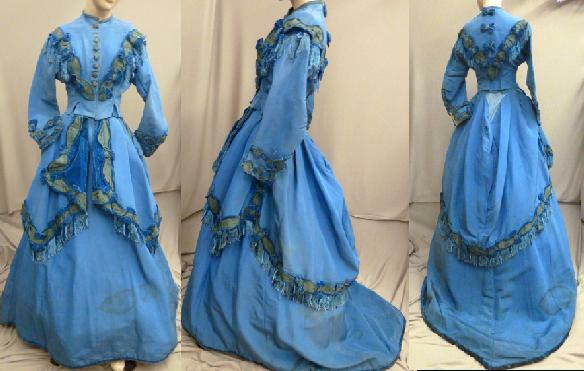 This auction is for a stunning original circa 1860s lady's three piece robin's egg blue ribbed faille special occasion gown with a sweeping train. The bodice is lined in ivory silk deisgned with fashionable square cut hemline with the back being adorned as heavily as the front. Matching self fabric buttons decorated with olive green silk thread crewel work at the front closure while the modest neckline is piped in silk. As you can see in my many photos, this ensemble is superbly adorned with velvet panels,velvet bows, inserts of olive green silk, all with the most beautiful silk AND chenille fringes. The skirt is a simply elegent while the overskirt is heavily embellished to match the bodice. 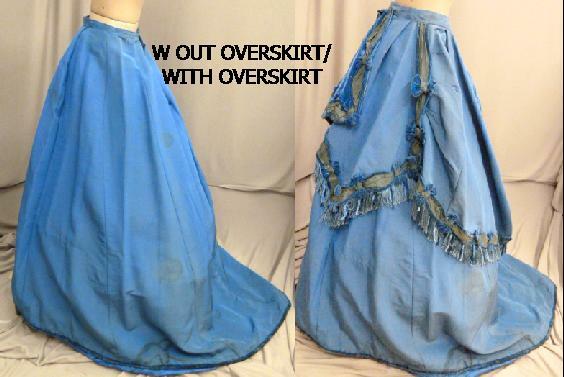 The back of the overskirt seems to have been left out and possibly a panel that was going to be covered but for some reason never was completed. Approx measuremens - 15.5" from shoulder to shoulder, a 34" bust, 22.5" waist, and 55" from shoulder to front hem. This was acquired from a very prominent (over 50 yrs old) Washington DC collection. 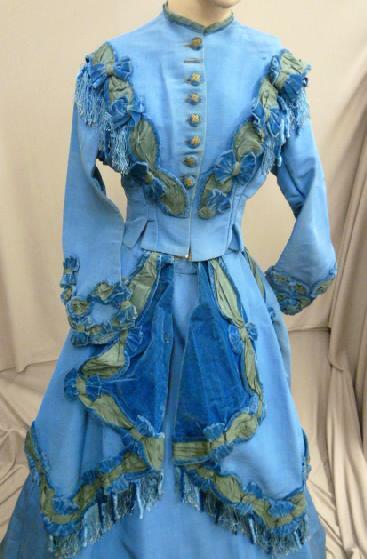 I purchased the collection over 15 yrs ago and at the time the collector expressed that this particular ensemble had been part of politician's wife's wardrobe, but for the life of her, she couldnt remember which one because she had bought so many "of those people's clothing" over the years. In overall sound as found condition, there is some marks that possibly are from water. 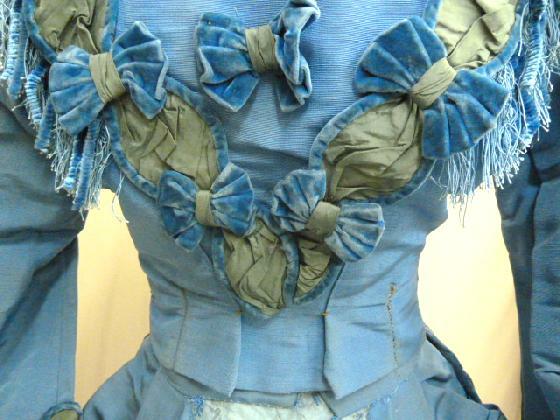 The bodice underarms has non professional period repairs and there is some loose stitching, one missing button. The skirt has a short area of fraying at the front just below the waistband most likely an easy repair. 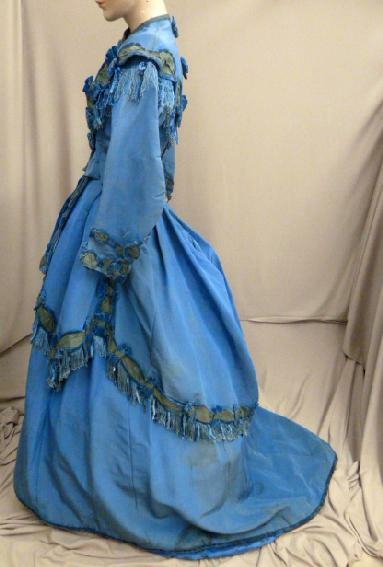 This is a grand 3 piece rare to find ensemble;it makes a fabulous display, perfect for study and with some TLC it would wonderful for actual wearing. The fabric is heavier than most and the colors are just stunning not to mention the extravagant adornment. Truly a rare find of the CIVIL WAR ERA!! This is a good few years after the American Civil War. 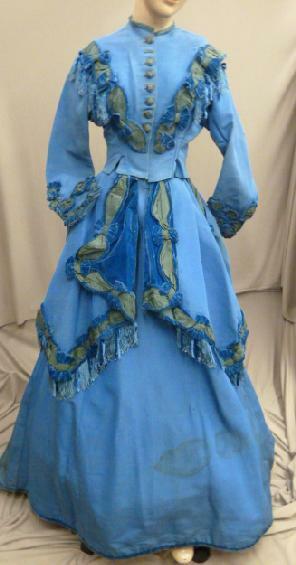 My guess is this is more 1870's than 1860's but it's right around that time.